Over last summer one of my best friends Tom got married, At the stag do I got talking to Toms youngest brother Alex. Who studied design in Leads, the conversation turned to cars over the course of the weekend. Alex has a couple of projects car projects on the go. the main one being an over hall of a Clio that only needs the following jobs doing clutch, starter motor, head gasket, valves seats, Gear box mount, Spark plugs, Oil change, Coolant Change, Cam Belt, Drive Belt, possibly valve tappets need adjusting, the interior needs sorting out and outside could do with a polish. 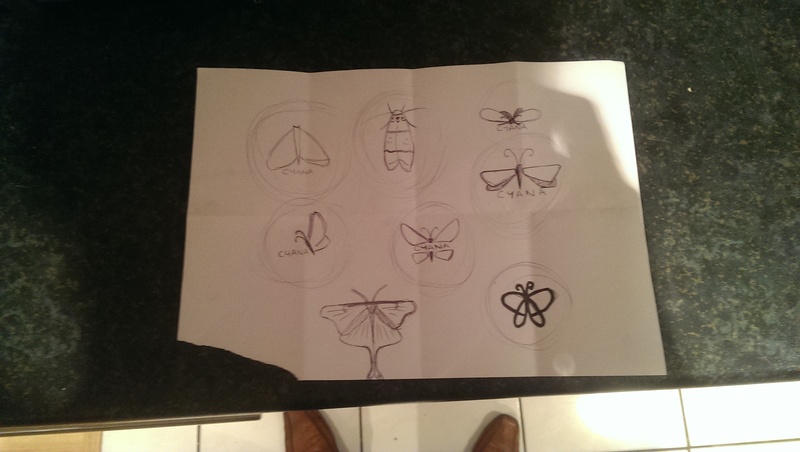 Alex did the these sketches for some other logo ideas. Alex has a blog http://alexhinxman.wordpress.com that’s an interesting read. I borrowed some tap spanners today from the friend that did the other logos. A couple of weeks a go I came to the conclusion that there was no logo for the Cyana brand despite the fact that the body work is molded for a bonnet badge. So I did a bit of googleing and found that “Cyana” is an old Greek word meaning ‘of the sky’ or ‘of the sea’ its origin is found in Greek history, named after a mermaid who sang and seduced sailors to their death. Unfortunately my knowledge of the classics is more than a bit lacking, so did not know how to go about confirming or denying this. Cyana is also a genus of moths in the Arctiidae family, and this seems to me a far more robust grounding for a logo. So I spent some time doing a couple of sketches and decided that my skills at this are worse than my knowledge of the classics, as you can see below. Luckily a good friend studded graphics design at Uni, so I talked to her about a logo over lunch and she came up with the some far nicer looking ideas. I like the center logo with Cyana through the center and also the logo above an to the right.